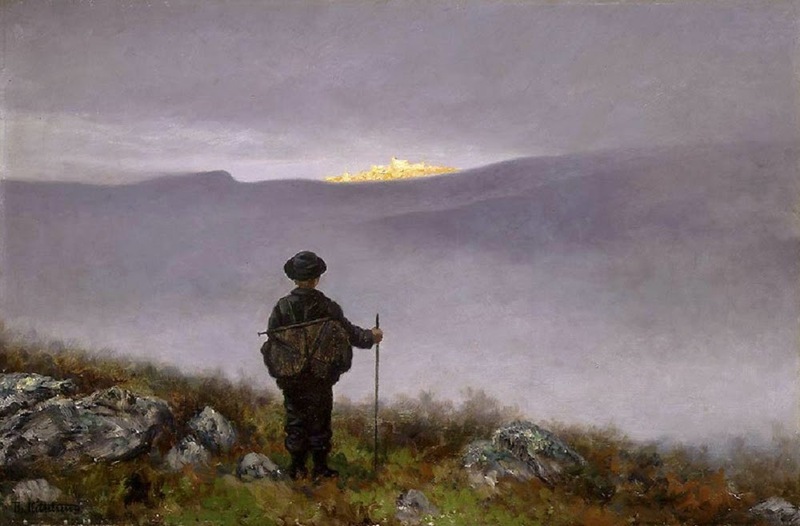 Once upon a time there was a man named Gudbrand; he had a farm far upon the sloping side of a hill, and therefore they called him Gudbrand of the Hillside. He and his wife were so reconciled, and were so settled with each other's deifferences that whatever Gudbrand did, his wife remained as loving and caring as always. But then one day, the wife said: "I think we should go to town with one of our cows and sell her, so we could get some pocket money. We're good enough people that we may well have some ready cash, just as others have. I do not know what the point is with having more than a cow, so it's a win-win if you ask me; instead of feeding and caring for two, we'll get half less muck to shovel." 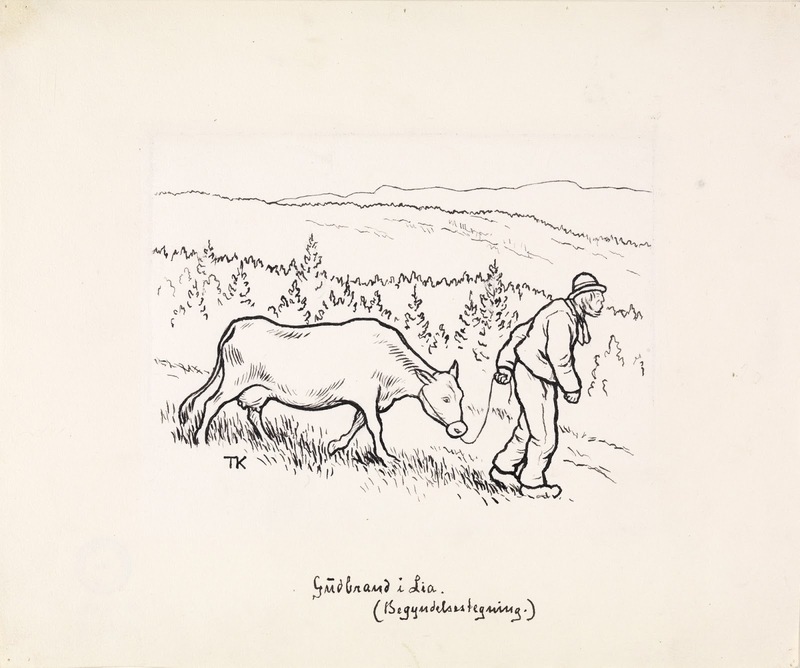 Yes, Gudbrand could like the sound of that; and so he took the cow, heading for the village to sell it. But when he got to the village, nobody wanted to buy his cow. Oh, well, Gudbrand thought, then I go home again with the cow; I know I have both stall and tether, and been back and forth and equidistant", and so he turned around to stroll back home to his wife. … and so Gudbrand turned around to stroll back home to his wife. 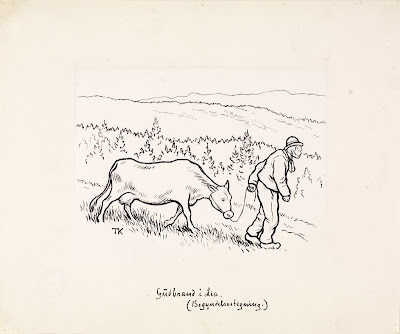 Illustration by Theodor Kittelsen, for "Gudbrand of the Hillside"
But when he had walked quite a bit, he met someone who had a horse he wanted to sell, and as Gudbrand thought it was better to have a horse than a cow, he traded with him. When he had gone a little farther, he met someone walking and driving a fat pig in front of him, and then he thought it was better to have a fat pig than a horse and traded with the man. Gudbrand went a little further; then he met a man with a goat, and then he thought it was better to have goat than a pig, and then he changed his pig with the goat. When he was well on his way, he met a man who had a sheep, and traded with him as well, for as he thought: it's always better to have sheep than goat. When he had gone for a while, he met a man with a goose; then he swapped the sheep with a goose. And when he had gone a long way, he met a man with a rooster, and traded with him, for as he thought: it is always better to have rooster than goose. Then he went on until it was later in the day; but then he was hungry, and then he sold the rooster for twelve shillings and bought food for them. "Because it's better to save a man's life than to have a rooster," Gudbrand of the hillside thought to himself. Then he was well on his way back home, he came to the nearest neighbor's farm, where he decided to make a visit. "How was the village?" asked the neighbors..
"Oh, it has now been so-so," said Gudbrand of the Hillside. "I can not praise my luck and I can not load it either," and so he told what had happened from beginning to end. "Yes you will have a warm reception when you get home to your wife," said the farmer. "I'm glad I'm not in your shoes." "I think it could have gone much worse," said Gudbrand of the Hillside. "But whether it is going well or badly, I have so kind a woman that she never said anything, no matter what I do." "Yes, so I've heard, but that does not mean I believe it," said the neighbor. "Care to bet on it?" said Gudbrand of the Hillside. And so they made a bet on one hundred shillings, and he stayed there until nightfall. After dark they pottered off together to Gudbrand's farm. There the neighbor stayed outside the door to listen, while the man himself went in to his wife. "Good evening," said the woman; "thank goodness you're there!" Then she asked what happened in the village. "Oh, so-so," said Gudbrand, "not something to brag about. When I came to town, no one would buy the cow, so I swapped the cow for a horse." "How wonderful," said the woman; "For aren't we good enough to drive to church, like the rest of our neighbours? Go out and let in the horse, children!" "Well," Gudbrand said, "I do not have the horse, for when I got a bit on my way, I swapped it for a pig." "Goodness!" shouted the woman, "you did right, I would have done the same. Now we can have pork in the house, and something to offer people, when they look in on us. What would we need a horse? People would say we had become so mighty that we can no longer walk to church as before. Go out and let in the pig, children! " "But I do not have the pig either," said Gudbrand; "When I came a bit farther, I swapped it for a goat." "Oh no, oh no, how well you do everything!" shouted the woman. "What would I do with a pig when I really think of it; people would just have said, that by the Hillside they eat up everything they have. But now I have a goat, then we can get milk and cheese, and even keep the goat. Let the goat in, children!" "But, I do not have a goat either," said Gudbrand; "When I walked a bit further, I switched the goat and got a sheep instead." "Oh, dear!" shouted the woman, "It's like I would have done it myself. Why would we need a goat? I would have to climb every hills and mountain to get it down again in the evening. Now that I have a sheep, I can spin wool and make clothes, and food too. Go out and let the sheep, children!" 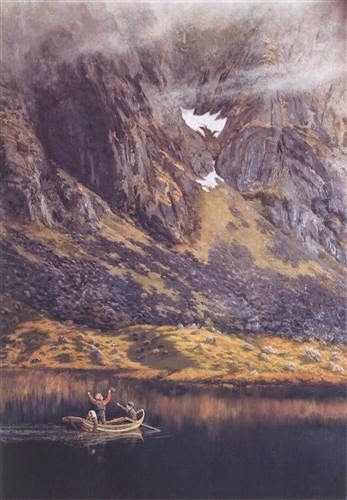 "But I do not have the sheep anymore either," said Gudbrand, "because I had gone for a while, I traded it for a goose!" "Thank you for that," said the woman, "and many thanks too! What should I do with the sheep? I have neither rock nor ten, and I do not care to sit and make clothes either; we can buy clothes just as before. Now I make roasted goose, which I've longed for, and fill my pillow with feathers. Go out and let in the goose, children!" "I do not know know how you figure it out," shouted the woman; "It's like you've read my mind. A rooster! It's the same as if you had bought an eight-day clock; every morning the rooster crows at four o'clock, so we can wake up at the right time. What would we do with goose? I do not know how to roast, and my pillow I can fill with grass. Go out and let the rooster in, children!" "But I have not got the rooster, either," said Gudbrand "When I had gone a bit farther, I was famished, and so I had to sell the rooster for twelve shillings, to save my life." "Now, thank God that you did!" exclaimed his wife; "How do you manage it, do everything just as I would have wished. What would we do with the rooster? We are our own masters, we can sleep in as long as we want. Thank God - when I have only you back again, who always know the right thing to do, I need neither rooster nor goose, neither pig or cow." Then Godbrand opened the door. "Have I won the hundred shillings now?" he said, and the neighbor must confess that he had. Thank God - when I have only you back again, who always know the right thing to do, I need neither rooster nor goose, neither pig or cow. Although Gudbrand of the Hillside obviously should be read with a little pinch of salt, that does not mean that there might also be something to learn from Gudbrand and his wife. We probably all agree that Gudbrand makes some unwise decisions, that he shows a critical lack of good business sense, and that his wife is a little dull-witted in her infinite kindness. Nevertheless, we must admit – they both win in the end. When Gudbrand comes home and tells what he has done, his wife has every right on her side to confront him with the absurdity of what he has done: "How could you do something so stupid?!" But she doesn’t. Instead, she identifies herself with her husband, letting him know that she would have done just same as he did. Gudbrand’s wife knows something that few of us make into reality: she does not use her marriage as a debate forum. Accustomed as most of us are to the logical arguments, it’s hard to realize that the art of debating and arguing does not have anything to do with a well-functioning relationship, nor does it help us to, understand human behavior. Reason alone cannot bring about an understanding of how to get along with people. In a relationship we can prove that we are right, and thereby achieve satisfaction – but when we do so however, the victory will be mere an empty shell. 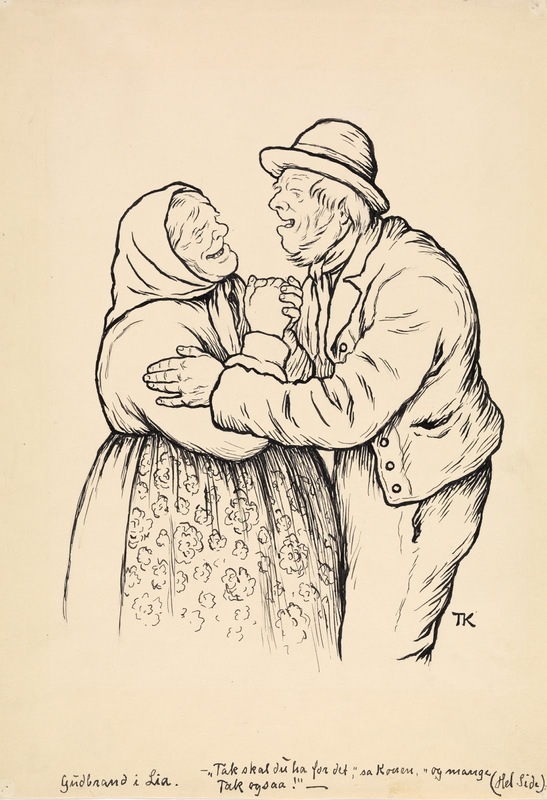 Gudbrand’s wife does not need to make it worse for her husband to make herself feel better, nor do she have the need to use her husband's loss as ammunition to prove that she’s better than him. She will not be a part of the competition about who has the right to feel most important. Instead of making her husband a loser, she makes them both winners. When Gudbrands wife says, "It's just what I would have done myself," she shows an ability to put herself into her husband’s place, to understand him, but not in an intellectual way. Instead, she accepts his experience and feelings at the moment, expressing what real understanding is all about. Each of us bring individual responses to different situations; it would be impossible to experience all situations exactly as our partner would experience them. Gudbrand on his side has clearly learned that his wife does not feel the need make him defend himself by always asking for explanations. He actually tells the neighbor that his wife is so kind that she never says anything, whatever he does. Her answers are not "reasonable" when viewed from a practical and logical point of view. They express that she wants to make the best of every situation. 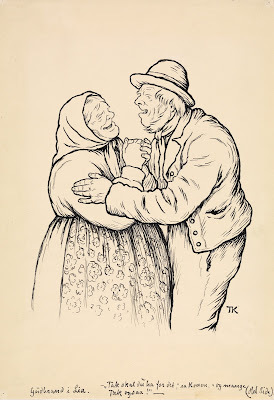 In a season that might be considered as particular popular for weddings and infatuations, perhaps it might be worth the time to get to know Gudbrand of the Hillside and his wife.